The eastern white pine is a large beautiful conifer. It has slender light green to bluish-green needles up to 5 in long, occurring in bundles (called fascicles) of five. The needles are prominently marked by a white line along their entire length. At maturity, the white pine often has a clear, cylindrical trunk for two thirds of its height, topped by a gracefully irregular, horizontally spreading crown. Its bark starts as smooth and dark green on younger trees and matures to fissured rectangular blocks on older trees. 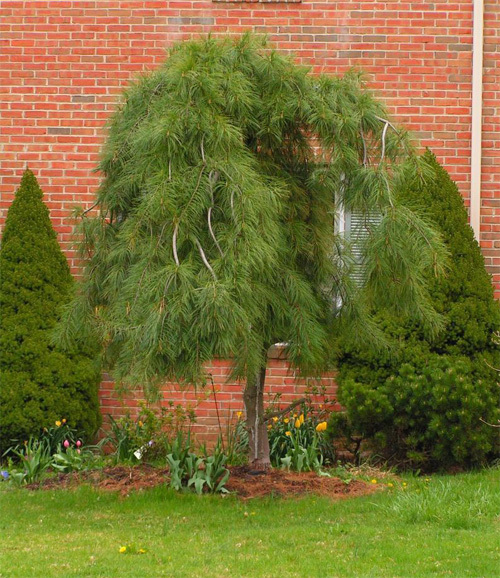 This magnificent evergreen tree makes a fine addition to the landscape especially in the northeastern United States. Beautiful and fast growing, the white pine is widely planted as an ornamental.